Nobody had school on Monday, so while my instinct is to distract them with things they can do themselves unsupervised (admittedly not much) so I could do some writing, I decided to be a decent parent and plan a craft project for us to work on. Both the small-ish, mobile ones enjoy crafts, and I’ve been stockpiling them on Pinterest, so I picked two that seemed like they’d be doable and where it wouldn’t be too hard to find supplies for them. The choices were pom-pom bunnies or glove monsters, and to be honest I’m glad they picked the bunnies, because cheap gloves are very hit or miss this time of year, and this way I didn’t have to deal with any meltdowns if/when we didn’t find them. On the surface, this looked pretty easy. Make pom-poms (I actually grabbed a fuzzy brown yarn from my mom a few months ago for this exact purpose), glue pom-poms together, glue on eyes/ears/nose/tail, ta-da. Of course, nothing ever goes according to plan, and I kind of have to just let them do it, because creativity is something I value and I want it to be something they value as well. 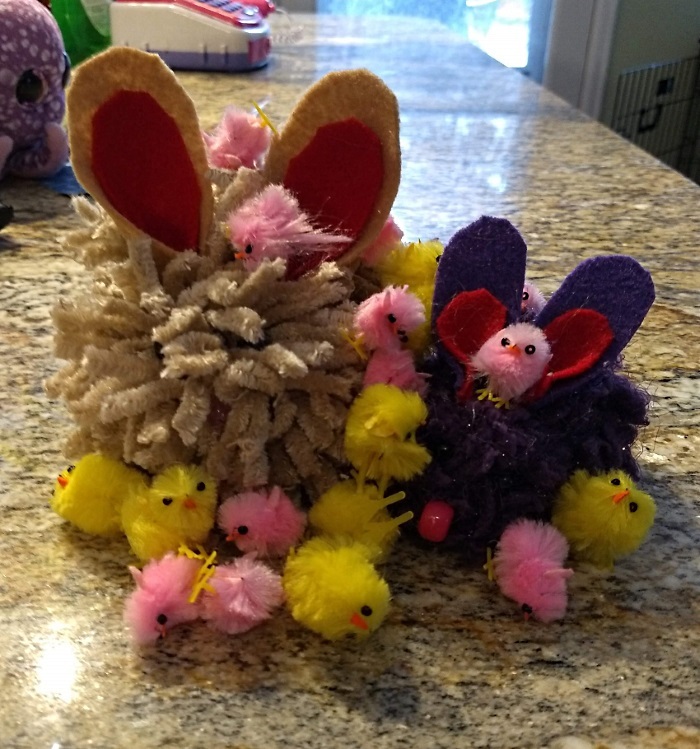 Instead of two pom-pom guides I had to make four, because the bigger mobile one wanted a giant rabbit, and the littler one wanted a tiny rabbit. And our yarn was too fluffy, so our bunnies look like long-haired guinea pig/rabbit hybrids. But, whatever. We had fun. And I only burned myself with the hot glue twice. The bigger one is named Fluffy and the smaller one Purple, because, well, still working on the creativity thing. Done any fun crafts lately, squiders? Tips to help me stop burning myself with the hot glue? I woke up yesterday to the news that NASA had officially declared Opportunity to be dead, which has made me sadder than I expected. I was working in the aerospace industry when Spirit and Opportunity landed on Mars back in 2004, and I remember it being a very exciting time at work. And, to be honest, I hadn’t thought about the rovers in years. Spirit was declared dead a long time ago, and then Curiosity was launched, and Opportunity slipped my mind. For a rover meant to last 3 months, the fact that it lasted almost 15 years is pretty dang amazing. And NASA did such a good job of getting us all to care about some little (I say little facetiously–neither Spirit or Opportunity is that small, and Curiosity is freaking huge) robots exploring on another planet. I know it’s just a machine, but Godspeed, Opportunity. Thanks for all your hard work. Hey, squiders, hope you’re having a good February! 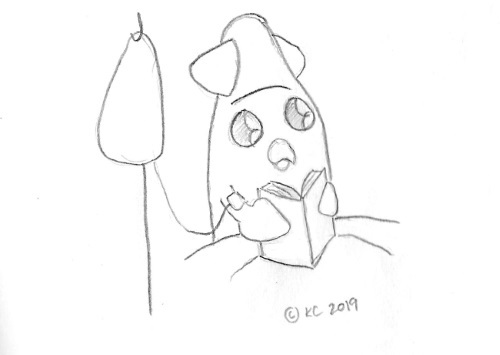 I had to have sinus surgery yesterday, but all things considered, it went well and I’m recuperating fine. However, I am a bit woozy and tired, so, while I hoped I would have the energy to blog today, I just…don’t. But I did draw you a landsquid. Anyway, we should be back to normal on Thursday. Til then, I hope your week treats you well!